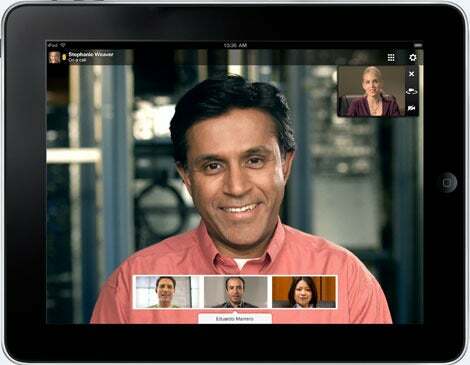 iPad in the Enterprise: A Videoconferencing Dream Machine? Three IT workers with iPads gathered around a whiteboard in a conference room in Boston to figure out how to improve a long-standing technical service- and running into more questions than answers. It would have been the beginning of an arduous process that included drafting inadequate original business requirements and technical design documents, circulating them to employees inside the operations groups around the world for comment and review, making revisions, and re-circulating improved documents. Instead, the IT workers struck upon an idea: With only three clicks (or taps) to launch and set up the newly arrived Cisco Jabber app on their iPads, they created a videoconference and invited a key employee in India to answer some of their questions. In doing so, they no longer needed back-and-forth emails and revisions. Videoconferencing, instant messaging and collaboration on the iPad is gaining steam as more iPads make their way into the enterprise. Companies have become more comfortable with these emerging methods of communication. They're pouring investments into Wi-Fi upgrades and videoconferencing networking technology from tech giants such as Cisco, IBM and Microsoft. The new iPad released earlier this year could provide an even greater lift. Its fast 4G LTE connection capability and Retina graphics display, which doubles the iPad 2's resolution, seem to be built for videoconferencing. "High-definition video on the iPad 3 is vivid," Fitzgerald says. Eagle Investment Systems has some 200 employees using corporate-owned iPads with Jabber, a Cisco app for instant messaging, voice, video and conferencing that Cisco extended to iPad and Windows in March. In the next 12 to 18 months, this number should grow to 600 employees. Roughly half of these employees will be outside the United States, in countries such as England, China, Poland and the Arab states. It's not just videoconferencing, either. Mobile devices are changing the way employees talk to each other. Late last year, Eagle Investment Systems studied how its employees were communicating internally and found a massive shift underway: more instant messaging sessions than email sessions. Of course, iPads, iPhones and other smartphones and tablets are great instant-messaging devices. "We think the Jabber component will very quickly become the predominant dashboard for how our users will communicate and collaborate internally," Fitzgerald says. Fitzgerald, though, is quick to point out that companies tend to put too much emphasis on the device-that is, the iPad and smartphone-and not enough on the underlying network. This can spell disaster for a CIO attempting to bring mobile videoconferencing to a company. For example, just look to Skype. People love it for personal use because it's free and are willing to put up with inconsistency and, at times, lackluster video sessions and voice-over-IP. But today's tech-savvy mobile worker won't put up with shoddy communication services at work. "When you start to develop your business service around this channel, you have to have some predictability," explains Fitzgerald. He decided on Cisco's Jabber because the app is deeply integrated into Cisco's cloud-based TelePresence network infrastructure, and thus he felt confident about Jabber's quality of service in a global environment. The network drives the decision, he says, never the device. "We have no idea what the device in front of us is going to look like 10 years from now," Fitzgerald says. "But building and deploying a network is a 10-year-decision ... so we do know what the network is going to look like." Read more about consumer it in CIO's Consumer IT Drilldown. This story, "iPad in the Enterprise: A Videoconferencing Dream Machine?" was originally published by CIO. Apple's third-gen iPad is defined by its amazingly sharp and crisp high-resolution display, as well as its option for 4G. The heavier weight is a disappointment; but the display, coupled with Apple's solid app ecosystem, makes this tablet the one to beat.